Easily confirm expression of Cas9 mRNA—the wild-type nuclease, nickase, and inactivated Cas9 double mutant—with our ready-to-go Cas9 RT-PCR Primer Set. With our ready-to-go Cas9 RT-PCR Primer Set, you can quickly and easily confirm Cas9 expression in cells or in vitro transcription assays. The amplicon for Primer Set 1 is 219bp and amplicon for Primer Set 2 is 122bp. These primer sets allow for detection of Cas9 nuclease, Cas9 Nickase and Cas9 double mutant at messenger level. The primer sets are compatible with Cas9 mRNA expression from any SBI Cas9 SmartNuclease construct and vectors from Dr. Feng Zhang’s lab as well. Figure 1. 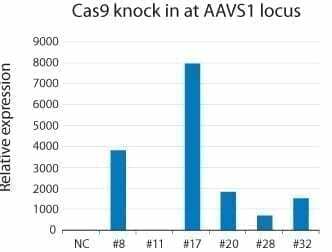 Use of the Cas9 RT-PCR Primer set to evaluate Cas9 expression after Cas9 knock-in at the AAVS1 site. We knocked the CAS9 gene into the AAVS1 site using the DIY Cas9-expressing Cells HR Donor and the All-in-one Cas9 SmartNuclease & AAVS1 gRNA Plasmid. We then tested the resulting positive clones for relative Cas9 mRNA expression using qPCR (left panel) and analyzed the two highest-expressing clones (#8 and 17) for Cas9-mediated cleavage activity using a Surveyor Assay (right panel, arrow indicated band showing Cas9-mediated cleavage). In the Surveyor Assay, only the two lanes with the Cas9 clones showed Cas9 activity (arrow), with the non-transfected cells showing no Cas9 activity.